Kishore Kumar born Abhas Kumar Ganguly 4 August 1929 – 13 October 1987) was an North Indian film playback singer and an actor who also worked as lyricist, composer, producer, director, screenwriter and scriptwriter. 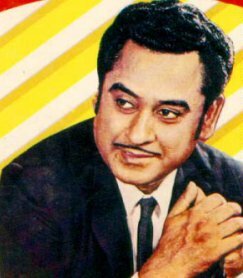 Kishore Kumar sang in many Indian languages including Bengali, Hindi, Marathi, Assamese, Gujarati, Kannada, Bhojpuri, Malayalam and Oriya. He was the winner of 8 Filmfare Award for Best Male Playback Singer and holds the record for most number of Filmfare Awards won for that category. Kishore Kumar is one of the most versatile singers ever in the Indian film history. However, no matter how popular one gets, celebrities always have their fair share of critics and in that light Kishore Kumar was no different. Sure he was great in funny songs, they say, but he never sang ghazals, qawwalis, bhajans and/or classical songs.